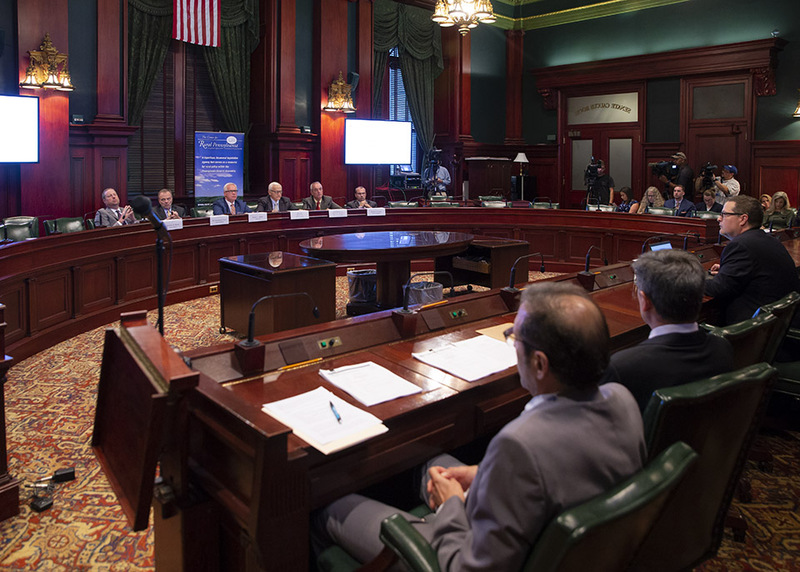 HARRISBURG – Members of the Center for Rural Pennsylvania Board of Directors and other legislators today convened at the State Capitol as part of a four year examination of the statewide opioid crisis, with a focus on treating addiction as a disease, such as heart disease or diabetes. 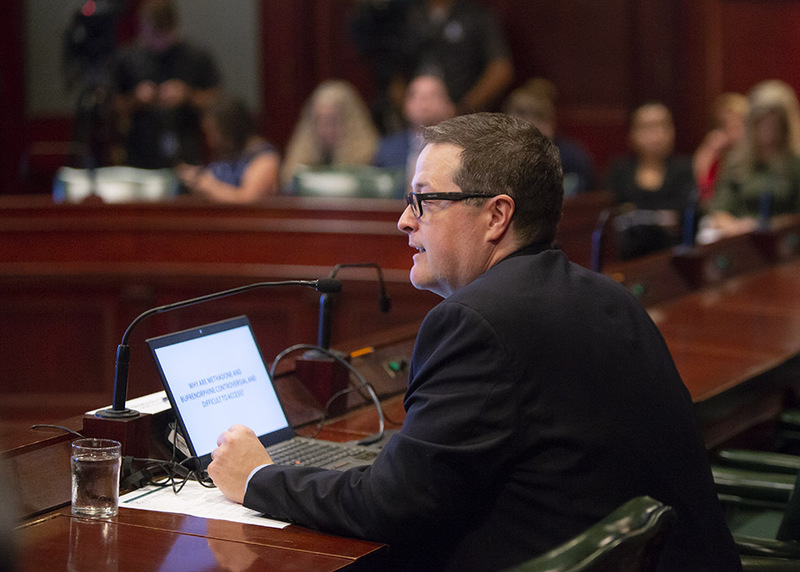 Beginning in 2014, the Center for Rural Pennsylvania (CRP), a bipartisan, bicameral legislative research agency of the General Assembly, held the first of 15 public hearings to discuss the state’s growing opioid epidemic. 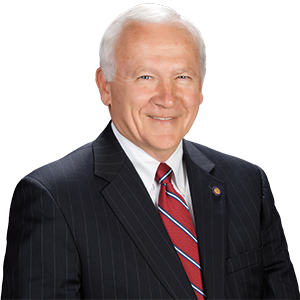 Tuesday’s hearing sought to highlight opioid addiction as a treatable, chronic condition, not a moral flaw. Addiction treatment has a long, flawed history across the nation. In the past, society viewed drug addiction as a moral failing. Methods of addressing addiction included imprisonment or commitment to asylums. Today, medical professionals across the world are recognizing addiction as a chronic disease of the brain with the potential for both recovery and relapse. According to the National Institute on Drug Abuse (NIDA), fundamental advances in the neurobiology of addiction have been made over the past two decades. Molecular and imaging studies have revealed addiction as a brain disorder with a “strong genetic component,” and this has spurred research on new pharmacological treatments. Pennsylvania’s Secretary of Health and Physician General Dr. Rachel Levine highlighted the state’s new medical marijuana program during the hearing as an alternative to chronic pain management and as one more tool in the state’s arsenal for treating opioid dependency. “Studies show that states with medical marijuana programs are seeing a reduction in the use of opioids and patients are reporting relief from their symptoms, most notably in the area of pain management,” she said. An agenda, testimony and video from today’s hearing, along with additional information can be found on Senator Yaw’s website at www.SenatorGeneYaw.com and on the CRP’s website at http://www.rural.palegislature.us/. 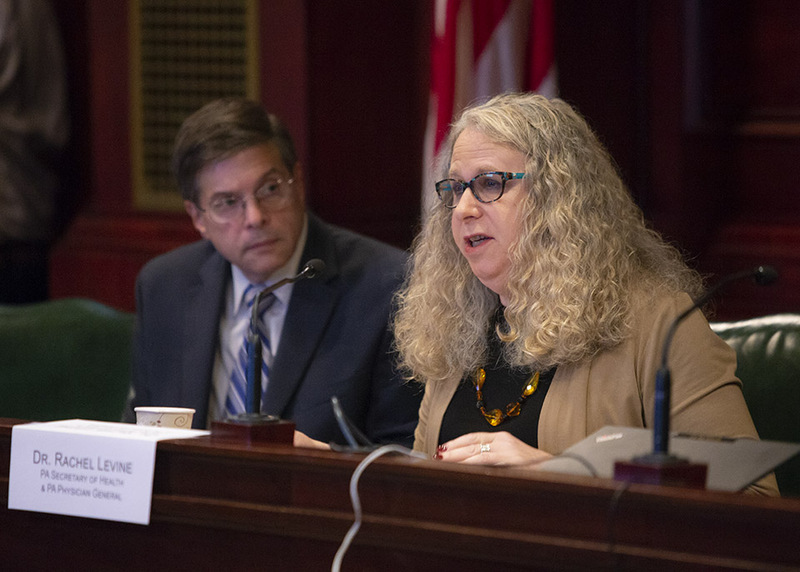 Pennsylvania’s Secretary of Health and Physician General Dr. Rachel Levine highlighted the state’s new medical marijuana program during the Center for Rural Pennsylvania’s 15th public hearing at the State Capitol. Senator Gene Yaw questions Dr. Bradley Miller, UPMC Susquehanna, during the Center for Rural Pennsylvania’s 15th public hearing at the State Capitol. Dr. Bradley Miller, UPMC Susquehanna, discusses opioid dependency and addiction treatment during the Center for Rural Pennsylvania’s 15th public hearing at the State Capitol. 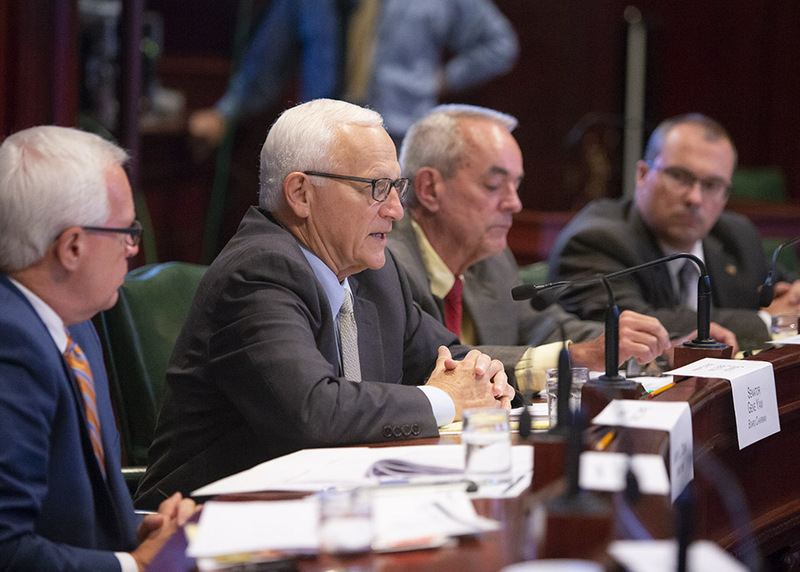 The Center for Rural Pennsylvania Board listens to Dr. Bradley Miller, UPMC Susquehanna, during the Center for Rural Pennsylvania’s 15th public hearing at the State Capitol.